Dishes featuring saffron rice originate from Southern Thailand. Khao Mok Gai often cooked in a big pot and served at special family occasions such as weddings and other religious. Simple Thai Food Recipes makes guests traditionally sit on the floor and eat this dish as part of a feast which usually includes a fish or meat curry. If you prefer, substitute ground turmeric for the saffron. Heat a little oil in a wok and stir-fry the rice with the saffron to mix together, then add the stock. Season with the salt and pepper, cover and cook for 10 minutes. Heat the oil and deep-fry the chicken drumsitcks until the skin is golden-brown, about 5 minutes. 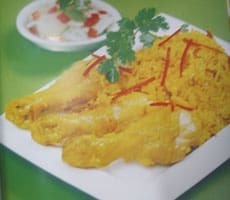 Remove the drumsticks, draining carefully, and add to the cooking rice together with the cardamom pods and the torn bay leaves. Boil to reduce the stock, then reduce the heat and simmer for about 20 minutes until the rice is cooked and all the liquid has been absorbed. Sprinkle the fried shallots, sliced chilli and coriander leaves over the chicken and rice and serve with cucumber relish.